It’s a sleepy meeting. The biggest debate is over a policy mandating students have at least 20 minutes for lunch. Murphy asks a few questions about the cost of some new vocational programs. Murphy grew up in the Red Lion School District and sent both his boys through the schools here. The area used to be rural, Murphy says, but it’s become more suburban as commuters from Baltimore and Philadelphia fill up new developments. Pennsylvania’s race for governor has featured a lot of back-and-forth on education. And education matters a lot to Pennsylvanians. Two recent polls show it’s the second-most important issue to voters in the gubernatorial election. But that word “education” can mean a lot of things. To Murphy, it’s a topic all about fiscal responsibility. To others, it’s about something completely different. Keystone Crossroads traveled to York County — home base of both Governor Tom Wolf and challenger Scott Wagner — to ask taxpayers, students, parents and educators a simple question: what about public schools matters most to you? Asked to describe their hometown, students Kelysha Huertas, Carmen Gonzalez, Imani Marshall and Trey Brenstein hit on the same theme: York isn’t the place you think it is. Is there violence? Yes. Poverty? Yes. But York is more than that, they say. And they believe their school — known officially as William Penn, but colloquially as York High — is as much a shelter from the outside world as it is a reflection. “The first thing that they really look at is the bad things that happen around us rather than the good things the school has helped us accomplish and become,” said senior Kelysha Huertas. Huertas moved here in 10th grade from Johnstown, and says teachers at York High treat her with more compassion than she’s received anywhere else. Junior Trey Bernstein also transferred in, despite the lamentations of his old teachers in the Eastern York School District. They told him York High would be violent and unruly, but he’s found the opposite. Junior Imani Marshall admits York High doesn’t have all the bells and whistles of neighboring high schools, especially when it comes to technology. York students feel, sometimes, like they’re playing catch up. Huertas thinks school should be better tailored to the individual, with more opportunities for accelerated students to zoom ahead and struggling students to stay back. Bernstein also thinks schools should cater more to what students want, rather than funneling everyone toward college. He plans to take over his grandpa’s hardware store some day, and wishes he could have focused on the skills he needs back in middle or even elementary school. Marshall wishes more teachers could relate to students on a personal level, and had the training to really understand what’s happening in their personal lives. And senior Carmen Gonzalez says more parents need to take an active role in their kids’ education. If they don’t, students end up folding to peer pressure from other students. “It’s just a chain reaction,” she said. 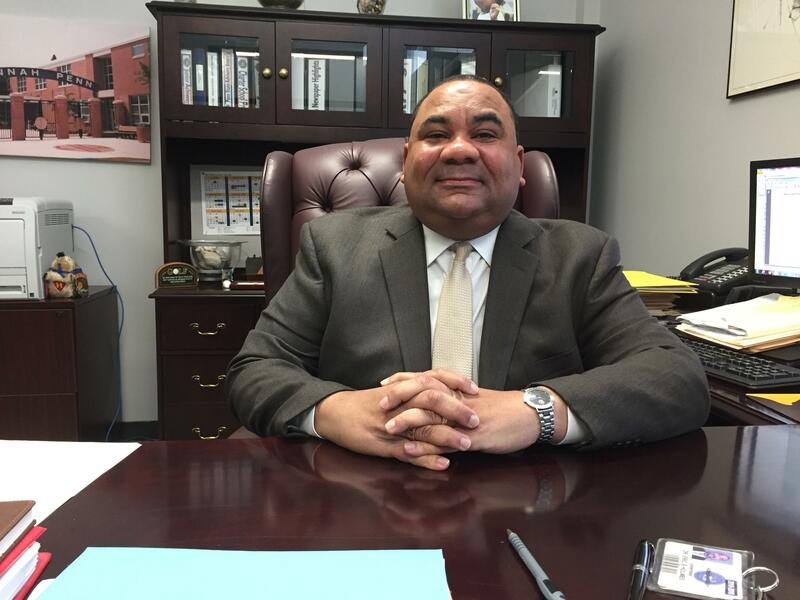 Eric Holmes, superintendent of the York City School District, can’t remember a time when he wasn’t thinking about educational inequality. Holmes graduated from South Philadelphia High School in 1982, reading textbooks that claimed Dwight Eisenhower was still president. “That’s why I’ve stayed in urban education for 32 years, because someone has to stay and fight for what’s right for our kids,” Holmes said. After four years at Penn State, Holmes received exactly one teaching offer, from the City of York. He’s been there ever since, ascending to the top post in 2013. Although its population has started to rebound, York’s story is a familiar one of deindustrialization, white flight, and blight. By the most recent census estimates, more than a third of city residents live in poverty. The school district has relatively high taxes, but its taxbase is weak and the district ranks near the bottom in the state in terms of local revenue generated per pupil. Each of the county’s other 15 districts receives at least double the amount York receives from its local taxpayers. Partly due to these factors, the district has struggled to match resources with student need. The state contributes the biggest chunk of the district’s revenue, but the state’s system in general relies heavily on local property taxes. “As long as it does, that’s inherently unfair. And we’re creating pockets of educational poverty,” he said. One fix would be to give York City even more money from the state. The new state funding formula is set up to help districts like York that have high poverty and high tax effort, and smooth out some of the funding disparities among Pennsylvania’s 500 school districts. But relief, as planned by lawmakers, will happen slowly, over time. If all the money were run through that formula, York would receive 71 percent more from the state than it does right now. Governor Tom Wolf, who hails from the northern part of York County , signed that formula into law and has fought to push more money through it. Now in campaign mode, though, he’s not giving specifics about what he wants moving forward. “With the system that we have we’re creating a ‘have-and-have-not’ world in education. And, to me, there are lots of little things that I could talk about. But unless we deal with that, nothing is gonna change,” said Holmes. The implementation of a formula has allowed Holmes to stave off tax hikes, but he says real help still feels a long way off. “The money’s coming. It’s trickling. I think that’s a good term to use,” Holmes said. Money isn’t the only thing on Holmes’ mind. He wants to expand vocational programs in his district so that high school is designed more as preparation for life and not exclusively preparation for college. Holmes also believes schools need to do a better job understanding and ameliorating the trauma inflicted on students by poverty and violence. Only a few weeks ago, a freshman at York High was murdered. The district sent a crisis team to the high school, something that Holmes says has become far too routine. Because my siblings went here. “I wanted to carry on the legacy of going to this school and I think being in a charter school is really the best thing,” said ShaTayla Bailey. It’s a sure sign of the charter sector’s maturity — that schools like Lincoln, which turned 18 this year, are now filled with the younger sisters and brothers of former students. Anne Clark, director of community outreach, worked in the school’s cafeteria shortly after it opened and has had about every job in the building since. Clark hails from York, but she worries not enough teachers in York can relate to the families they serve. “Really our educational programs for teachers have not prepared them for urban education,” she said. ShaTayla Bailey and her classmates say the number one issue in schools today is bullying. They think more schools should adopt the Lincoln approach, which includes a “buddy bench” on the playground where lonely students can talk with members of the safety patrol. “I feel like there should be a club or something that could be anti-bullying,” said Bailey. Fellow fifth-grader Joseph Rosario Rodriguez thinks more kids at a school need a “purpose,” and proposes adding more school activities. His classmate Eliangelize Echevarria, meanwhile, puts the onus on herself. “I [ask] the ones getting bullied if they want to play with me,” she said. 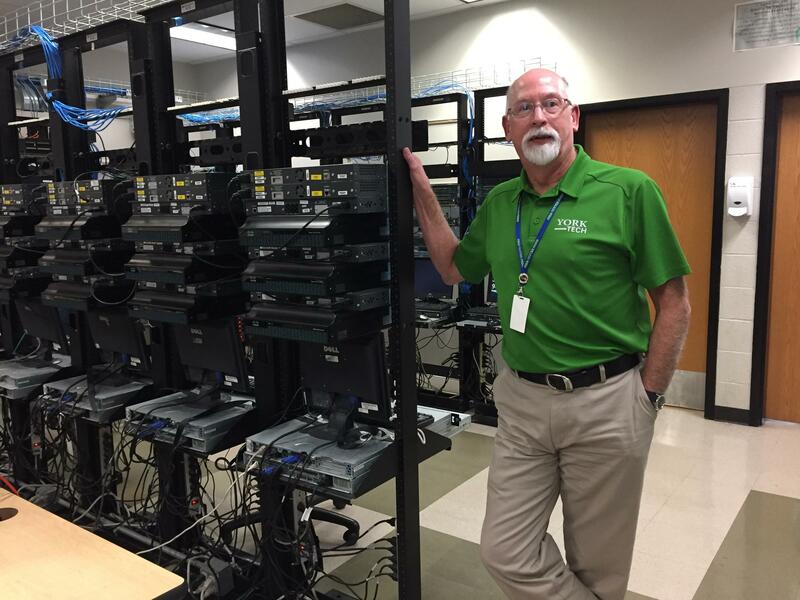 Kerry Stauffer’s room on the second floor of the York County School of Technology hums with technological hardware: 48 routers, 76 switches, and two specialty fiber optic switches. You may not know what any of that means, but Stauffer’s computer networking students do. That’s why Stauffer believes they’ll stay a step ahead in the job market. “They’re working on the same equipment here they would when they step out into the real world after graduation,” said Stauffer. Founded in 1969, this technical high school draws from every corner of York County. The school houses programs in the traditional vocational vein like carpentry, masonry, and welding. But there’s also tracks in cyber security, early childhood education, and healthcare. Stauffer knows he’s biased, but he thinks he’s at the nexus of where K-12 education is headed in Pennsylvania, a future where technology and job-readiness reign supreme. Both parties seem to agree with him. There’s bipartisan support for focusing more on career and technical education. Policy makers see it as an antidote to the college debt crisis and a way to fill the type of jobs Pennsylvania will produce in the coming decades. Superintendent Eric Eshbach of the Northern County School District also spends a lot of time thinking about how to prepare students for the jobs of the future, but not as much time as he’d like. That’s because in February of this year, a gunman charged into Marjory Stoneman Douglas High School in Parkland, Florida, killing 17. Eshbach was at a conference for superintendents in Nasvhille when he heard the news. He and his colleagues knew their jobs were about to change, and a note Eshbach received the next day confirmed his suspicions. Over decades as a teacher and administrator, Eshbach always opposed placing armed guards in schools. That note — and others like it in subsequent days — wore down his resistance. 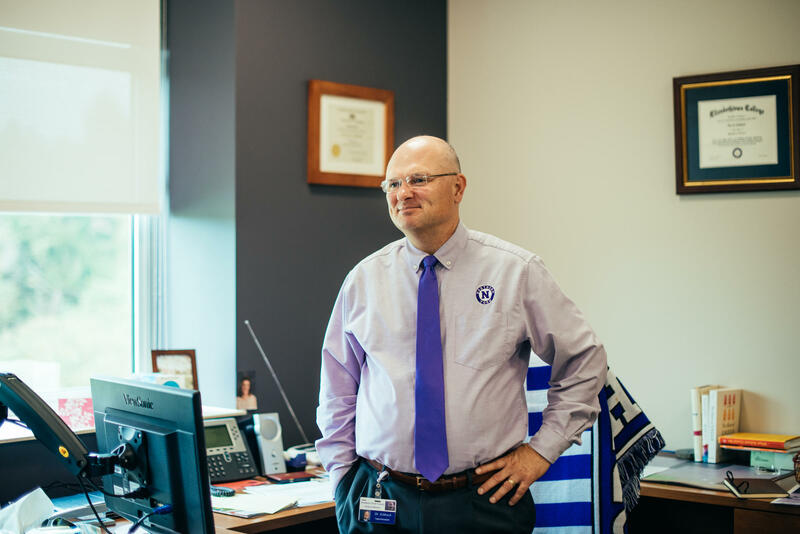 “I felt that as a life-changing moment for me when I had a student saying, Dr. Eshbach, what are you gonna do to protect me and my friends,” he said. In order to reduce the cost of hiring security, Eshbach lobbied local legislators to change a state law that prevented districts from paying contract workers to patrol schools. Harrisburg obliged. Eshbach interviewed former police officers working for private security firms, and by fall Northern York had armed security in its middle and high schools. In recent years the district has also added cameras, buzz-in systems at doorways, screens so office staff can monitor school parking lots, and systems that scan visitors to make sure they’re not on child predator lists. 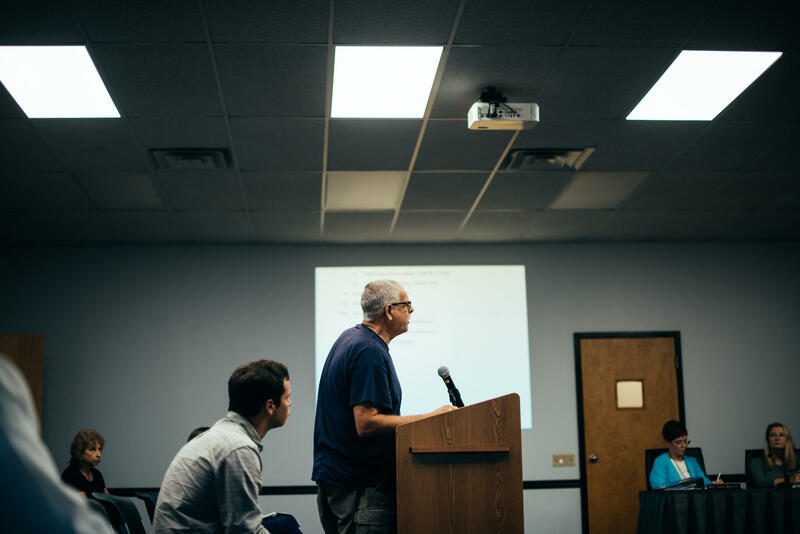 For each one of these “reactive” measures, Eshbach tries to add a “proactive” one like more guidance counselors, school psychologists, and school-based counseling services where community members can get psychological help. Kennard-Dale High School, near York County’s southern border with Maryland, is in the kind of small town where everyone shows up for the homecoming football game. There’s genuine suspense when the stadium PA announcer calls out this year’s homecoming court, and the bios of each winner have a distinctive, rural ring to them. The wide-open spaces around here are part of the appeal, explains Christina Markel, a mom of two. There are good paying jobs in nearby Maryland, where Markel manages a doctor’s office. But land up here in York County is cheaper, especially if you want a big plot. Markel makes it her business to know everybody. 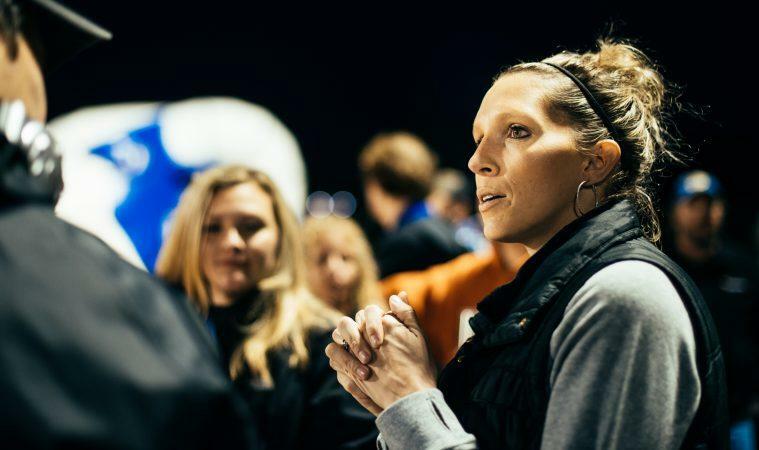 She helps organize youth cheerleading and lacrosse, and recently started a Facebook page for people to keep tabs on what’s going on in the South Eastern School District. As much as she cares about education, Markel doesn’t have many complaints with her district. She grumbles a bit about the Common-Core-inspired math homework her kids takes home. But asked what she’d change, if anything, about the local schools she says there’s only one thing: She’d like the community to raise money for a turf football field. Markel watches the homecoming game pressed up against a fence. She’s boisterous, but promises her rowdiness goes to another level when watching her son’s Pop Warner games. After a winding conversation she mentions a proposal, backed by Republican candidate Scott Wagner, who grew up just outside York City in the center of the county. Wagner’s plan would eliminate property taxes for schools and replace them with higher income taxes. The idea sounds good to her. And we start chatting about it. But before Markel can finish, a Kennard-Dale player breaks off a big run. And just like that, education policy gives way to the buzz of everyday life. Somewhere there’s a governor’s race happening. But on Friday night in tiny Fawn Grove, Pennsylvania, you might not hear about it above the roar of the crowd.